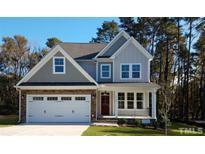 Below you can view all the homes for sale in the Ellington subdivision located in Apex North Carolina. Listings in Ellington are updated daily from data we receive from the Raleigh multiple listing service. To learn more about any of these homes or to receive custom notifications when a new property is listed for sale in Ellington, give us a call at 919-759-5775. Ellington Cove is a unique oppty with just 16 homes adjacent to Ellington Place--close to Costco, shopping, Apex Community. Park. PHOTOS REPRESENTATIONAL. Aug. '19. MLS#2223105. 4919. Free screen porch for contract by 1/31/19! Photos representational only. MLS#2223100. 4919.
w/ contract by 1-31-19! Photos representational! MLS#2223050. 4919. Sought after neighborhood/schools, close to Costco, major shopping/restaurants, 160 ac. Apex Community Park. MLS#2223039. 4919. Pre-Sale Kitty Hawk MLS#2222470. 4919. So many upgrades and details included in this exceptional custom home! MLS#2210264. 4919. Near Costco, restaurants & shops. Move in just 60 days! MLS#2209922. 4919.